Earlier this month I had noted that there were a couple of boats trying to row/sail down the Northwest Passage. It turns out that my awareness of the number was off by a number of boats - there were several others that I was not aware of. However the ice came early and with darkness approaching, and the days and nights getting colder, both the two that I was following - the Arctic Joule and the Fairmont's Passion ended their attempts at Cambridge Bay. In both cases this was about half-way along their intended route, but among other things early encounters with ice slowed their progress, and they both called it quits yesterday - coincidently arriving at Cambridge Bay within hours of one another. Sail World notes that there is 60% more ice in the Arctic this year than there was at this time last year, and that both ends of the Northwest Passage are, therefore, already blocked trapping those trying to make it through. Figure 1. Locations along the Northwest Passage. 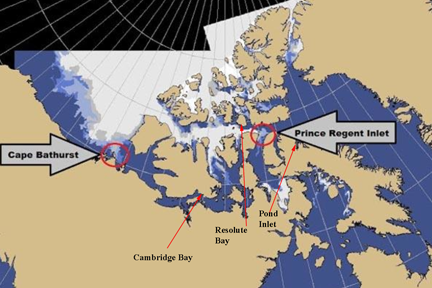 I have taken the Sail World map and added the position of Cambridge Bay and the two target end points for the ventures. The Arctic Joule was heading for Pond Inlet, while Fairmont's Passion was aiming for Resolute Bay. I suspect that news stories commenting on this indication that the Arctic is clearly not ice free will be somewhat sparse. And few will note that the Inuit made it a thousand years ago, establishing the Thule colony in Greenland from their origins in Alaska. There is really nothing else to say.